The ex-Chelsea midfielder believes the 20-year-old has a future in the England and Chelsea team. Moving abroad to get more game time is an option that more and more young English players are taking and succeeding in. The German Bundesliga, in particular, has become a place of great opportunity for young players caught amongst the fringes of the top Premier League clubs. Chelsea’s Mason Mount is no exception. 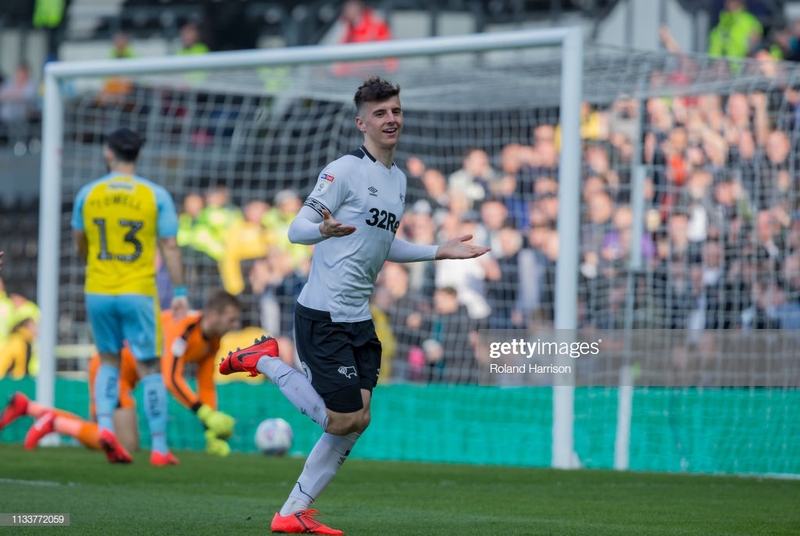 The young attacking midfielder has not yet broke into the Chelsea first team but has enjoyed a successful spell under the watchful eye of Frank Lampard at Derby County where he will remain for the rest of the season. Now though, it is understood that Bundesliga outfit, RB Leipzig have shown serious interest in signing the creative attacking midfielder. The team currently sit third in the league table behind only German giants Borussia Dortmund and Bayern Munich. On the move, Lampard said the decision is down to the player but believes the 20-year-old could be a successful Chelsea and England player. "That's his call,” he said. "It depends how Chelsea see it and how he sees it. It depends what is the best plan for him. What we can say is that the year he's had - he's had a great year which has put him one big step up the ladder. "I think he can be a top player. I know that's a broad statement, he's already been in an England squad, but I believe he'll go back to Chelsea and be a big player for Chelsea. I know that's his dream. "He'll play for his country I hope, because he has all the attributes on and off the pitch. He's a delight to work with, as all the players have been this season." Mount has enjoyed a good but frustrating season in the Championship with the Rams. The loanee has managed five goals and four assists in 27 Championship games. He scored on his Derby debut and then again on his more recent return in a 6-1 riot over Rotherham United. Mount suffered a hamstring injury which forced him to become absent of the team pushing for promotion for nearly two months. His absence from the squad was noticed indefinitely. Derby lacked creativity and saw a dip in results without the ingenuity of the Chelsea player. The move to Bundesliga should not be seen as a step down in any instance. The best example has to be Jadon Sancho who moved from Premier League champions Manchester City to Dortmund and has quickly established himself as a fan favourite. Sancho has since gone on to become the top assister in the German division and has undoubtably earned a place in the England squad because of it. Nothing is a certainty at Chelsea at the moment. The only thing that remains certain is that Mount’s loan will end at the end of the Championship season. Chelsea currently have a transfer ban looming over their shoulders which will mean they can do nothing but sit and watch as Mateo Kovacic goes back to Real Madrid. Does this create the perfect opening for Mount as Maurizio Sarri introduces more youngsters into his side days after he handed Callum Hudson-Odoi his first Premier League start?